Darren and I don’t like to wait for adventure! We’ve tried to accomplish every dream imaginable and we’re doing a great job with it. About two years ago, he told me he wanted to try kiteboarding. He watched countless videos on the techniques and skills involved and he wanted to get out on the water. Life has a funny way of happening, though, and we forgot about his dream to master the kite on the water. We planned on trying it together two years ago when we were in Florida but the timing was off and we never made it. We tried again when we were in Jamaica for our wedding but the winds wouldn’t cooperate and, alas, it never happened. 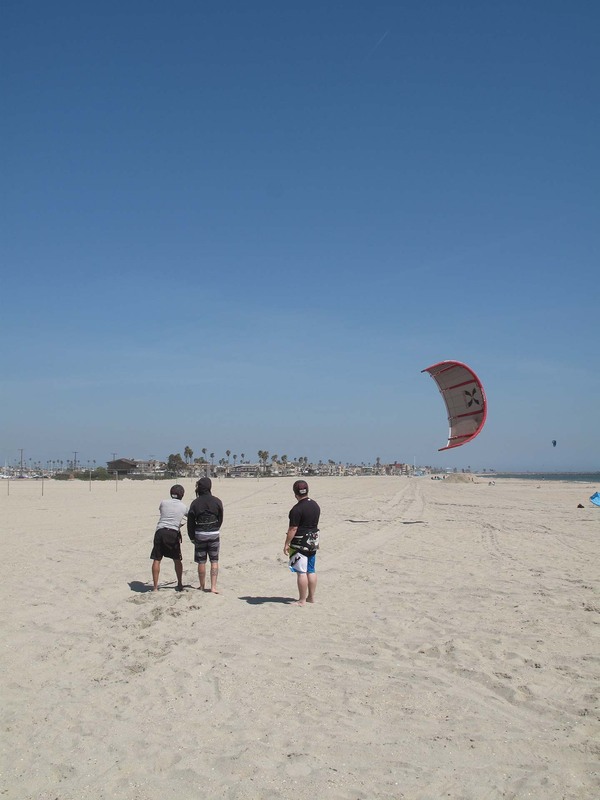 Darren was starting to take it as a sign that kiteboarding wasn’t in his future and he left it slip to the back of his mind.You’d think since we live in southern California we would have tried it by now, but no such luck. Finally, two weeks ago, I looked up kiteboarding companies in the area and I was determined to schedule a full course-to-ride lesson for him. On Saturday, he finally crossed kiteboarding lessons off of his bucket list… only to add purchasing kiteboarding equipment to his new list since he loved it so much. With similarities to sailing and tinkering skills required for perfection, Darren found a new hobby to add to his extensive list. 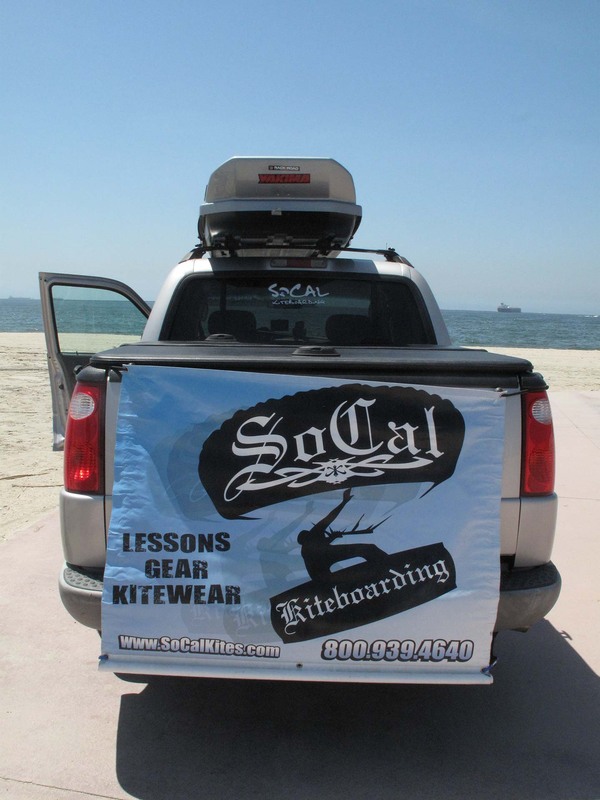 SoCal Kitesurfing was the school of choice. Running out of Belmont Shore, they are a results oriented instruction center where you get personal attention and commitment to your success. The instruction is done by the owner and kiteman, Bart Miller. Bart loves teaching and adventure sports. 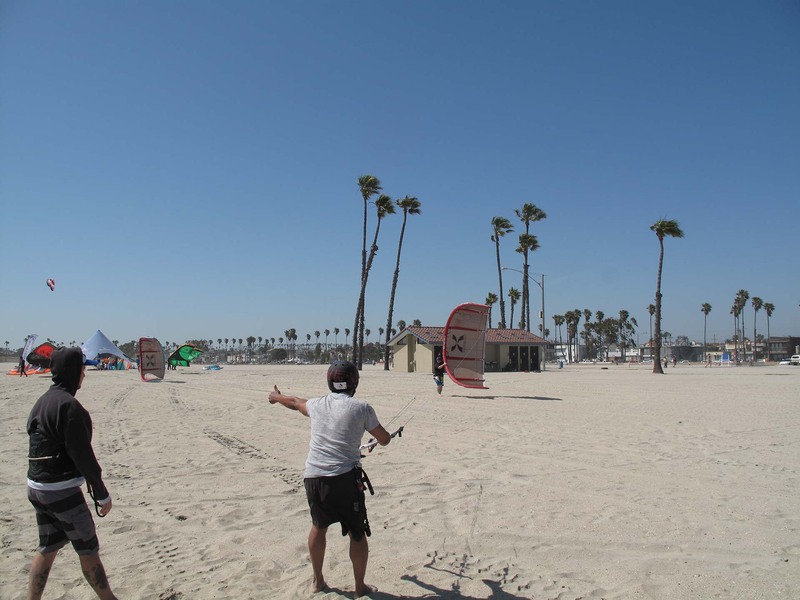 He said, “Kiting combines the best of many sports. If you love sports, adventure, and travel like I do, this sport will change your life! Great times, friendships and adventures await you!” During Darren’s 6 hour lesson, Bart’s words held true; he loved the sport and the adventure, but it was the personal interaction with Bart and the other students that really made the experience memorable. 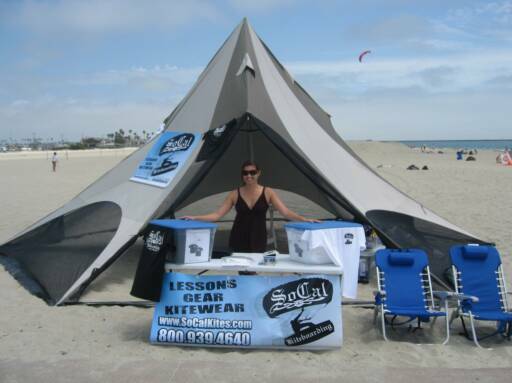 The SoCal Kitesurfing “office”, or tent set up on the beach, created a welcoming environment where others were encouraged to setup, demo gear, and share tips while kiting. Darren approached the tent to a welcoming owner, Bart, and an instructor-in-training, Nick. Once the other three guests arrived to the semi-private lesson, the instruction began. Bart gathered the students into a circle and gave them a quick run-down of the safety guidelines and the procedures for the gear. Bart is a trained IKO professional. He’s insured and certified and adheres to the highest standards in teaching and safety. Safety was his first concern and was part of the entire process. Almost immediately, Darren and the other students were able to play with the gear while Bart safely guided them. Darren enjoyed the active learning process where he was able to learn by doing rather than listening to a boring lecture. Starting with a trainer kite, they learned about the wind window and how to handle the kite within that window. They practiced walking forward and backward with the kite as well as sitting down and controlling the kite while stabilizing it in the sky. The power of the trainer kite was the most surprising part of the entire day for Darren. He had no idea how powerful it could be. He said, “the trainer kite had enough power to drag you down the beach.” For a little kite, it could certainly get you moving. After they got the hang of the trainer kite, they then learned how to rig and launch a real kite, which can be a difficult concept. Darren quickly learned that if you launched the kite too aggressively or if you didn’t keep it on the edge of the wind window, then you could literally go flying into the air; controlling the power of the kite was a major part of the learning process. The afternoon session started with power strokes in the sand. The power stroke is the basic power generating move in kiteboarding; it’s what you do every time you start riding. During the power stroke practice, Darren realized the precise technique required to kiteboard successfully. Once in the water, they learned body dragging, where you lay on your stomach and allow the kite to drag you out into the water. With Bart’s support, he tried to get up onto the board. As time progressed, Bart had less and less involvement allowing the students to practice on their own. Learning how to fly the kite was more technical than Darren anticipated. After trying paragliding a few months ago, I asked if it was similar and he said, “there is so much more to kiteboarding. With paragliding you just let the kite lift you off the ground. With kiteboarding, though, there’s not just steering; there’s also power. The bar changes the angle of attack for the kite so if you bring the bar up or down it increases or deceases the power. Plus you still have steering and launching the kite. To handle the kite while floating in the water is difficult. You need to control left and right, power and alignment, and the board on your feet. It takes incredible balance and power just to get up. It’s more like sailing where you are constantly tweaking the sails for maximum power and wind resistance.” Although Darren’s “sail boat” was just big enough to stand on and his tacking, zig-zagging towards the wind and then away from it, was less than perfect, his sailing skills made handling the kite in the wind almost second nature. Physically and mentally drained after 6 hours of training, Darren returned home with wide eyes and endless chatter. He wanted to explain every little detail of the day and relive every minute of it. As he rambled on about the kite, the laid-back, friendly personality of his instructor, the water, and the power, I was proud of arranging the day for him. Darren didn’t just tick another item off of his list. 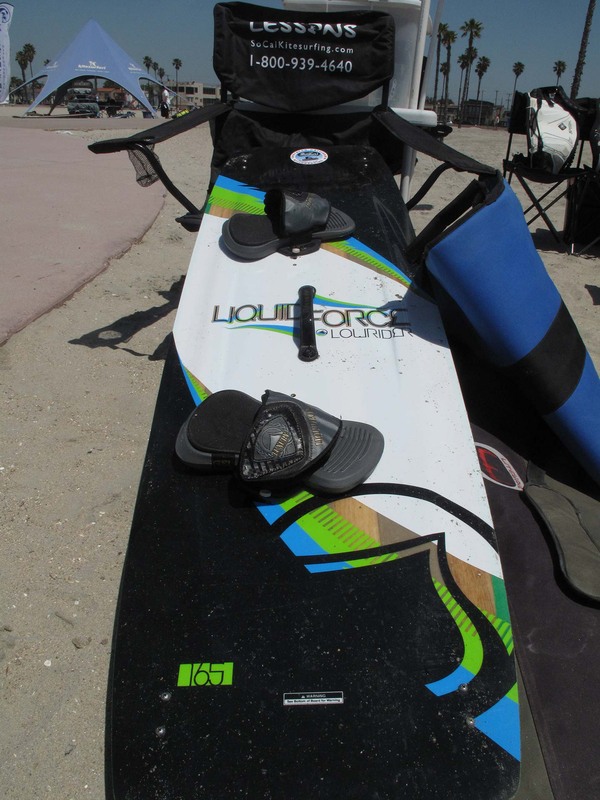 He gained knowledge of a new sport and it opened his eyes to the possibilities that kiteboarding offers. He’ll most definitely return for customized lessons and advanced kiteboarding. The continuous tinkering and techniques required to master the kite are a perfect match for Darren’s personality. The best part about trying something new is that you never know what amazing experiences will change your life and leave you wanting more. 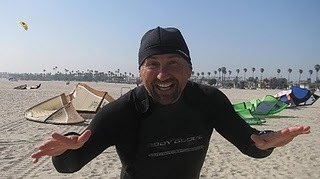 I don’t know what’s next on the life bucket list, but SoCal Kitesurfing found a permanent home on Darren’s yearly, and possibly monthly, lists. This entry was posted in Adrenaline, Adventure, Bucket List, California, California Outdoors, Travel, USA, Water Adventure and tagged Adrenaline, adventure, beaches, bucket list, Bucket List Publications, California, culture, kiteboard, kiteboarding, landscape, Lesley Carter, life, photography, SoCal, southern California, surfing, travel, USA by lesleycarter. Bookmark the permalink. Awesome! I marked this one off two years ago and have been hooked ever since! Did you buy some gear or do you just take lessons? Just lessons and rentals, the last gear I bought was my scuba gear. Diving is a true passion, Kiteboarding is just down right fun! You have great energy and always crossing something exiting and fulfilling off your list. Love your posts. You are an example :). At first, kiteboarding can be exhausting as we all try to fight the pull of the kite, but very quickly as one starts to understand the placement of the kite in the air and the board balance, the sport becomes very zen and peaceful gliding over the water effortlessly being one with the element. You don’t need to be physically strong as you arms are only for steering and not for holding the pull of the kite. I saw a kiteboarder on the Grand Traverse Bay in Traverse City Michigan a few years ago. So it’s a sport for all climes. My brother-in-law wants to try it on ice. I’m certain I’d enjoy it more on water, but it’s all pretty cool. Maybe the next time he goes, I’ll go with him. Really cool. Unfortunately, I think I may have to add this to my own list! You make me feel like a wimp…, my bucket list is much more down to earth. I’ve never fancied these types of thrills but love hearing about other people’s adventures. I did zip line thru a rain forest in El Valle, Panama and went hot air ballooning for my 30th BD. Our next trip is to Alaska. Bart was an amazing instructor and made things a little easier. It’s great that we’re surrounded by such amazing talent. Thank you for the nomination. It’s appreciated. I now follow your blog and I’ll check back regularly. Your so brave! I rode roller coasters (Pleasure Beach – Blackpool) last year for the first time and adrenaline sports/practices are definitely not for me, I’m glad I tried though! Oh, to be young again…! I’m very happy for Darren. There’s nothing like big waves and high winds to really get some air. I don’t have a lot of ride time, but just enough to be dangerous … and have fun. Keep it up. Thanks for the ‘like’ on my Being Dad blog. Children absolutely don’t inhibit travel, sure it’s different, but just as fun. My wife and I were keen (non technical) mountain climbers, and like you have travelled extensively. Now we have different holidays, but still have fun travelling. We took our daughter to Vietnam when she was 4 months old, and so far, have done 8 countries with her in tow. Enjoying your blog, cheers. You have pressed “Like” on 2 of my posts about the Lakers. I just wanted to say thank you so much. I am a HUGE fan of your blog and im a desperate aspiring sports writer looking for ANY opportunity possible. If you could please subscribe to my blog and help me promote and encourage others to subscribe it would mean the WORLD to me. Thank you so much and keep up on your amazing blog. Nice! I saw a bunch of kite surfers in Hawaii and thought it looked like a blast. Wow, looks like hard work, but fabulous fun! Daring and breathtaking!Any potential risks? 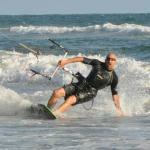 Like any physical sports, kiteboarding can be dangerous without proper lesson and training. Having said that, if using good judgement and common sense, the risk of getting hurt is minimal. The good thing about kiteboarding is that you don’t have to get wet right away or climb into a wetsuit. 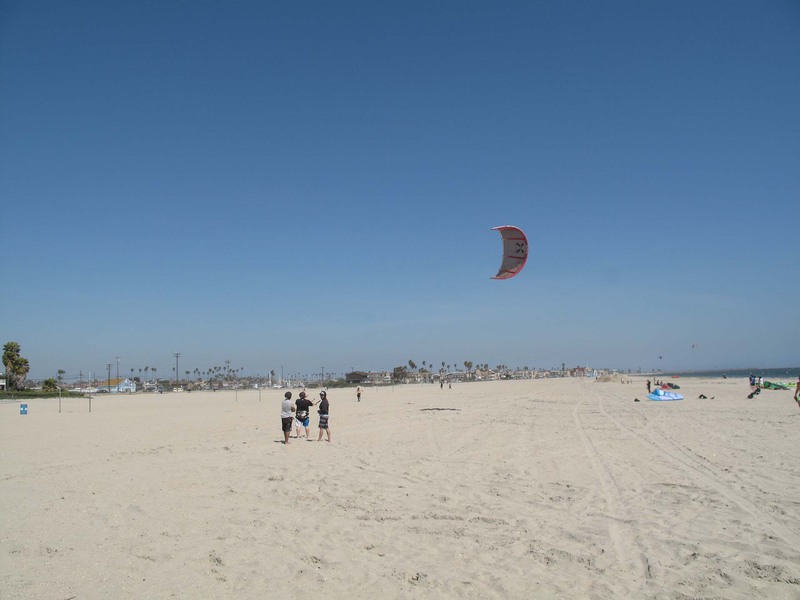 One can go to the beach in their work close after work and practice flying a 2m trainer kite on the beach in wind from 5 mph to 8mph. Not only it is good fun but also great energy after a long day at the office. Some friends of mine left skydiving for good and picked up kiteboarding. Since I’m not sure I will return to skydiving, I was looking for a sport similiar. 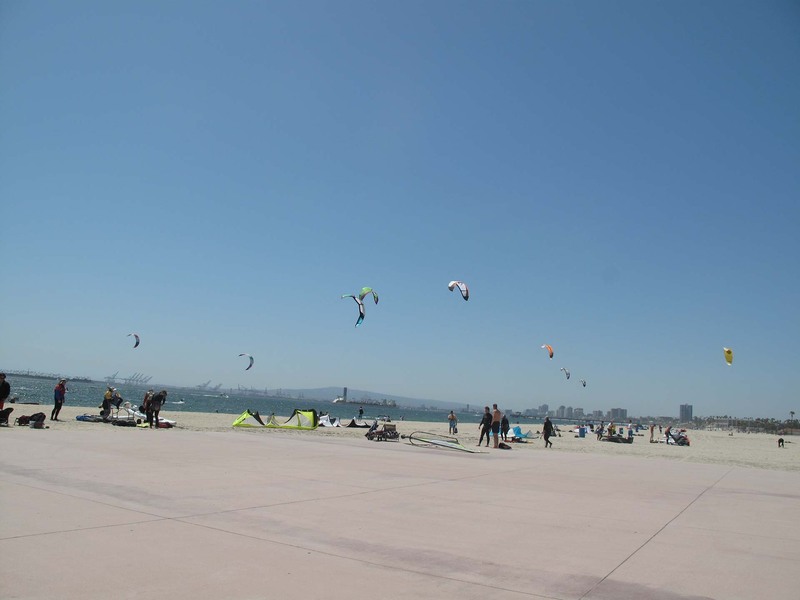 Those friends said that kiteboarding offers the same thrill and excitement and the people. I’ve been looking in to it. Glad he enjoyed it. And you are right about crossing something off your list. YOu don’t know where it’s going to take you. Awesome write-up. I’ve always wanted to try this…looks like a blast. If you will be buying a trainer kite, don’t get one that is too small. They are too zippy and don’t handle much like the real thing. Get one that is about 1.8m to 2.5m. You will be able to have endless fun in winds from 5mph to 10mph and when you get comfy anything above that. Have fun. 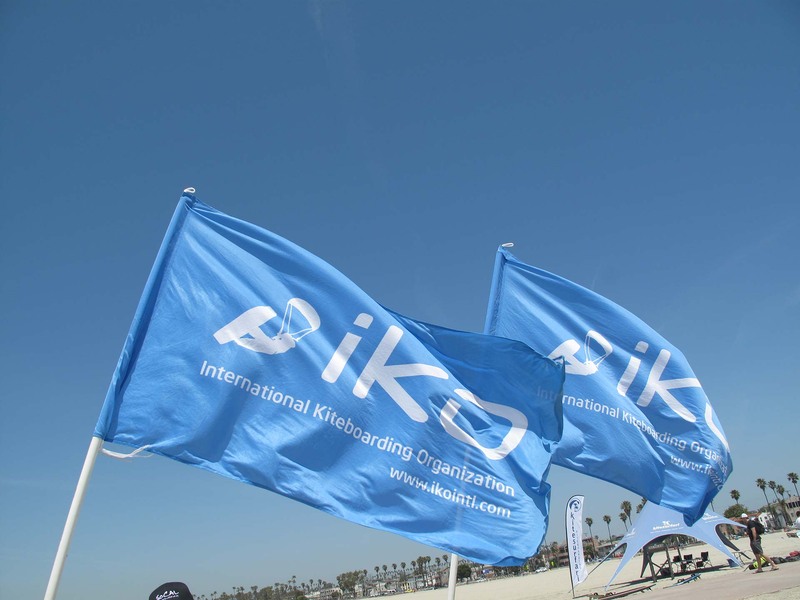 Now, why have I never heard of kiteboarding before? I am excited about this sport, just reading about it here. Wonderful of you to arrange this day of training for Darren! I am very impressed with this instructore, as well. I’ve done a bunch of windsurfing so wondering how it compares to that? We’ve only tried windsurfing twice but I really enjoyed it. You can get up on the board when windsurfing much more easily than kiteboarding so it’s better for beginners, but I think with the technical aspects of kiteboarding, it is more intense. So happy for Darren to have experienced this. Sounds like a whole lot of work for a whole lot of fun! So glad you made it happen! Adrenaline rush for sure!! Thank you Lesley for the “Buckets” website. I have read some very interesting well written posts and they are helping me to be a better writer! The photography is first rate. It is very inspiring. Your blog isn’t too shabby either! I guess you have to “be one” to “know one!” It’s also nice to see someone be so thoughtful of their husband. Your photos and blogs are very creative! I love the whole concept of your site. You’ve done a lot of things that I would love to try on my “bucket list”! I would like to learn this, but I feel too old. Although I am strrong and fairly in shape, I am older than it looks like anyone in these pictures. This is on my bucket list, but wonder if you have super beginning classes?